LDE London, the first British offshoot of Les Dames d’Escoffier International, has named Sheila Dillon as its new Honorary Dame. The presenter of BBC Radio 4’s The Food Programme and award-winning investigative journalist will be an ambassador for the 32-year old global network of women leaders and professionals in the fields of food, fine beverage and hospitality, founded in 1985 in New York in honour of Auguste Escoffier. The mission of Les Dames d’Escoffier International, mirrored by its London affiliate, is to provide leadership and educational opportunities, share knowledge and support its members. 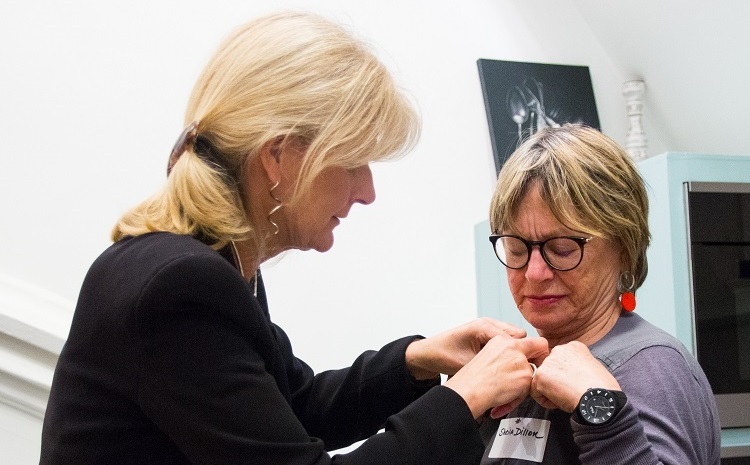 Dillon received her membership pin at the group’s annual New Members’ Induction event held at Michel Roux Jr Cookery School at Cactus Kitchen in London. She was inducted alongside new members Angela Malik (Teacher, Leiths School of Food & Wine) Bridget Colvin (Teacher, Michel Roux Jr Cookery School), Louise Gill (Head of Professional Skills Academy, University of West London), Heather Holden Brown (author agent, HHB Agency), Caroline Hope (Tea Historian, Tea and Scones), Kate Howell (Director of Development and Communications, Borough Market), Mary Pateras (Wine Importer, Eclectic Wines) and Alex Robson (Co-owner West End Drinks). ‘We are absolutely thrilled to have a woman as renowned and accomplished as Sheila Dillon as our Honorary Dame this year. She is a shining role model for women in our industry, highly respected amongst her peers and loved by the multitude of listeners to The Food Programme. Past Honorary Dames have included Pervin Todiwala, co-founder of Café Spice Namaste, Sally Clarke, chef patron of Clarke’s Restaurant, and Kim Woodward, the first woman to be named head chef of the Savoy Grill and who has since joined Skylon as executive chef. The chef, author and educationist Valentina Harris, is the organisation’s immediate past president and continues to take an active role in its activities alongside Sue Carter, Secretary and Treasurer. The third ‘Edible London’, a 4-day transcontinental ‘insider’s’ culinary tour hosted by LDE London for US Dames will be held 16th-21st May 2018, alongside two optional add-ons: Edible Scotland and Edible Cotswolds. The organisation currently raises funds to support Luminary Bakery and its own Kate Ray Memorial Bursary.